The United States Congress designated the Mount Skokomish Wilderness (map) in 1984 and it now has a total of 13,278 acres. All of this wilderness is located in Washington and is managed by the Forest Service. 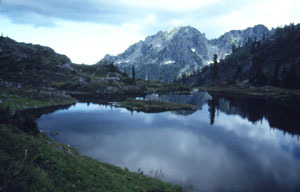 The Mount Skokomish Wilderness is bordered by the Daniel J. Evans Wilderness to the north. Mt. Skokomish Wilderness is located in the southeast corner of Olympic National Forest, just north of Lake Cushman. Two long ridges here, running roughly northeast to southwest, support several bold rocky summits and numerous sharp spires. Elevations range from about 2,000 feet to 6,434 feet on Mount Skokomish, which anchors the northwest boundary. The northern ridge rises to Mounts Skokomish, Lincoln, and Cruiser, with ragged Sawtooth Ridge, popular for its excellent rock-climbing opportunities, stretching between Lincoln and Cruiser. The southern ridge includes the summits of Mounts Pershing, Washington, Rose, Ellinor, Jefferson Peak, and Tran Spire, all interesting and often challenging climbs. Between the ridges lies the headwaters basin of the Hamma Hamma River, which gathers its waters from Mildred Lakes and tributary streams in the western portion to flow east across the Wilderness. Magnificent old-growth western hemlock, western red cedar, and Douglas fir dominate the forest in the lower elevations, providing a shady home for elk, black-tailed deer, black bears, and mountain lions. Higher elevations display firs, pines, and dwarf juniper, and open rock faces alive with marmots and mountain goats (which look like pockets of old snow from a distance). Most of the area is wild and ruggedly free, penetrated only by four short and wondrously neglected trails. The Putvin Trail crosses the northeast corner of the Wilderness, climbing steeply up Whitehorse Creek to gorgeous Lake of the Angels inside the park. The faint Mildred Lakes Trail runs to Mildred Lakes below the Sawtooth Ridge. Short, trails provide access to Mounts Rose and Ellinor in the southern portion of the area. Lakesides have suffered abuse, and campfires are not allowed near bodies of water. Planning to Visit the Mount Skokomish Wilderness? How to follow the seven standard Leave No Trace principles differs in different parts of the country (desert vs. Rocky Mountains). Click on any of the principles listed below to learn more about how they apply in the Mount Skokomish Wilderness.